Have you tried any monthly subscription boxes? If so, what is your favorite? There are so many boxes out there for clothing, beauty products, pets, toys, activities, etc. I’ve research through many monthly subscription boxes to find the right one. I wanted to find a subscription box for my kids. There were some boxes that only one kid could enjoy. After all of my research, I found a monthly subscription box that had couple options. Night In Box! You can choose between a Date Night In Box or a Kids Night In Box. 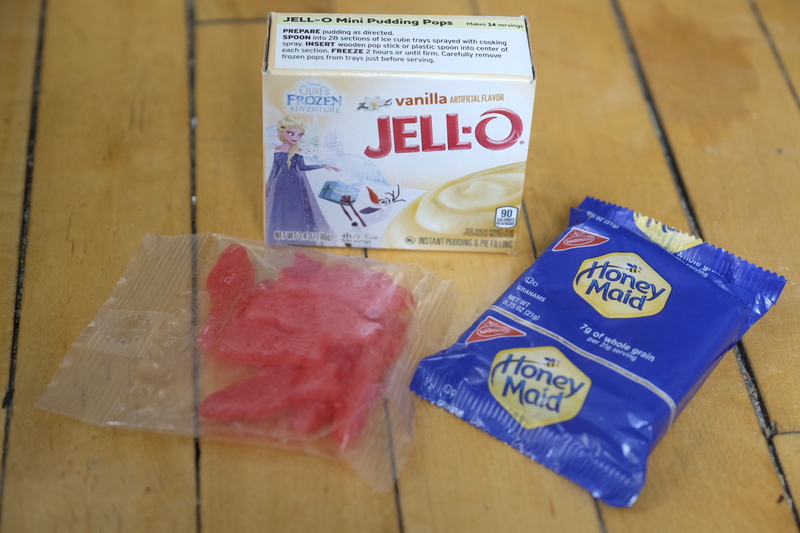 A couple can enjoy a date night at home with a Date Night In Box monthly subscription box. 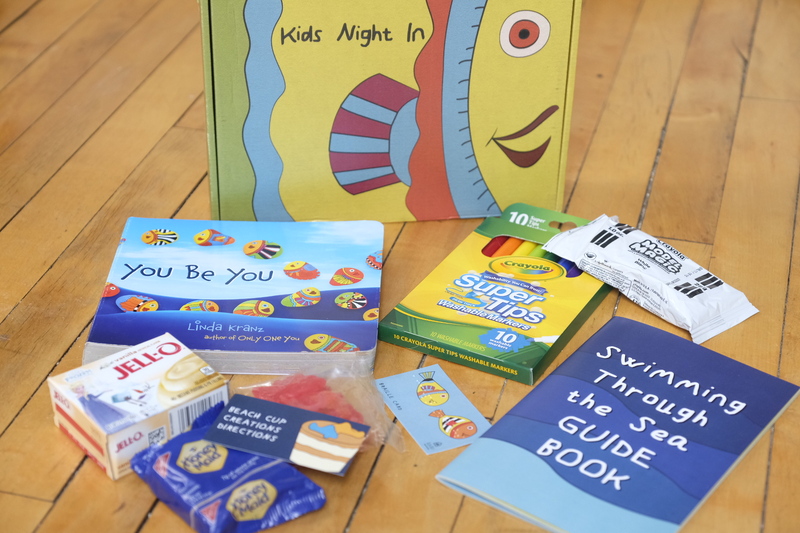 Kids Night In Box is a perfect box for all kids to enjoy for a fun night at home! Each box is focused on a theme. 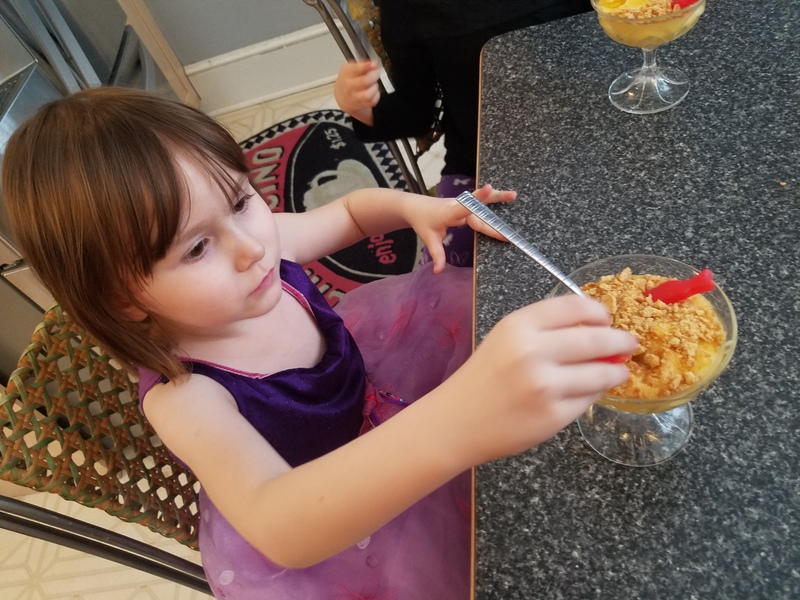 Kids get a fun night learning and having fun. 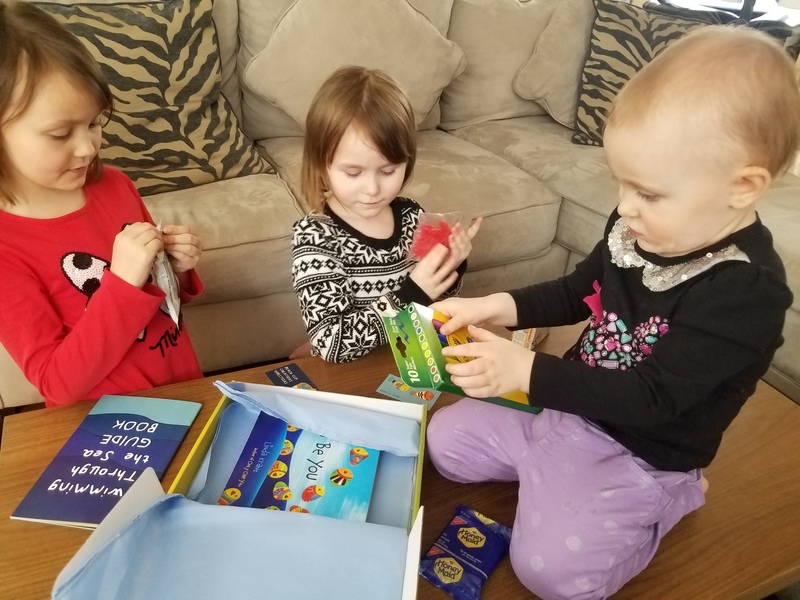 A box includes a book, several fun activities, learning about important people in history, meal ideas, and a fun snack. I got the opportunity to work with Night In Box! I chose the Kids Night In Box so my girls could enjoy a night of fun. 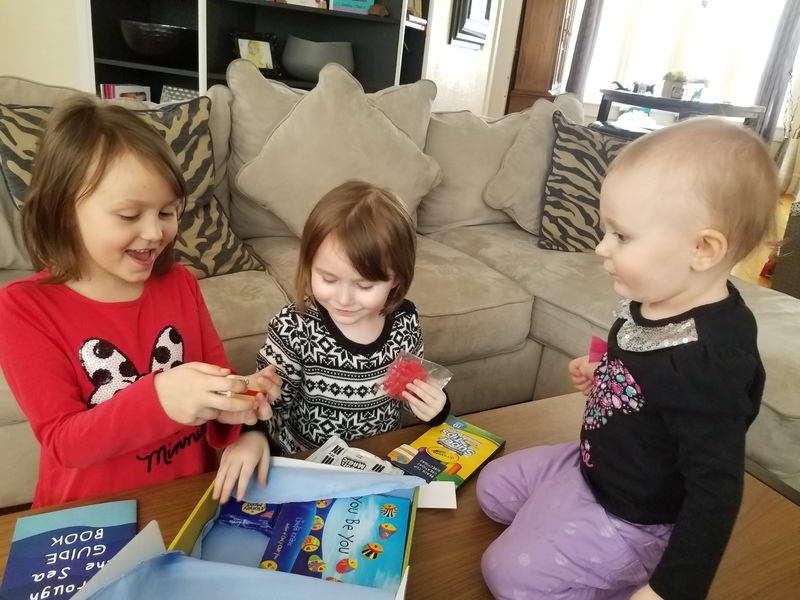 When I told my girls, Katie, Sophia, and Elizabeth, that they were going to get a fun activity box in the mail, they were really excited! The box arrived in our mailbox this weekend. 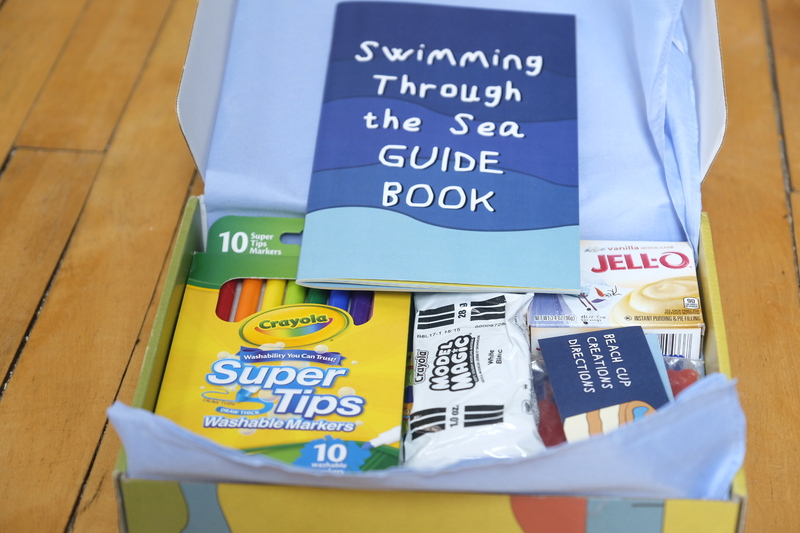 This month’s Kids Night In Box theme is Swimming Through the Sea. 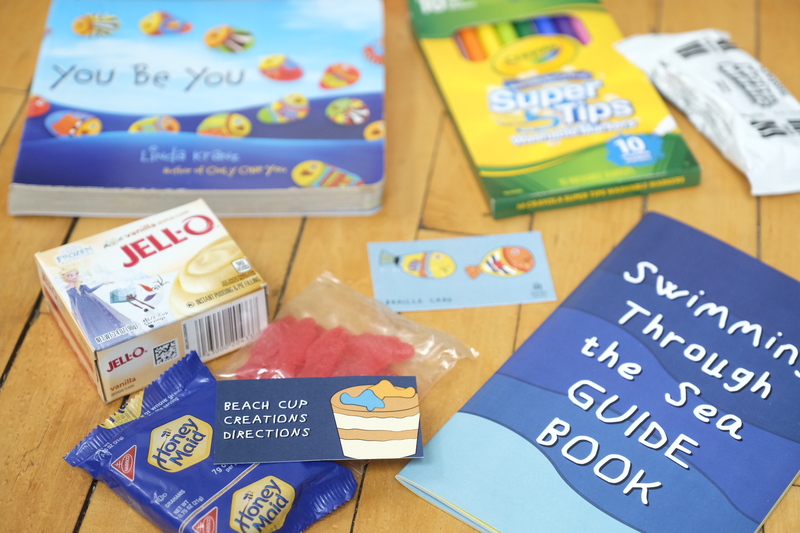 The box focuses on genuine awareness and compassion for those who are different. 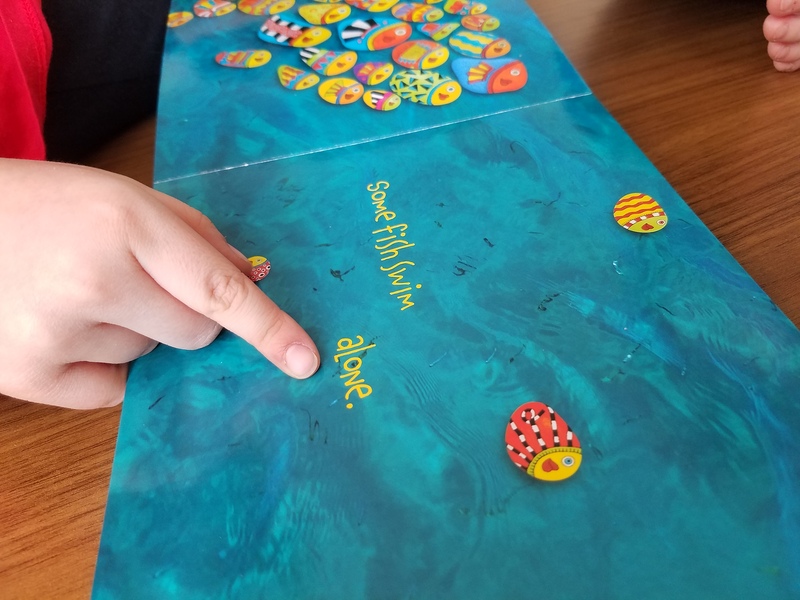 It is important for kids to have the skills of empathy and kindness to help build relationships with others. You can check out how Swimming Through the Sea came to be. We had to open up our Kids Night In Box right away that afternoon. 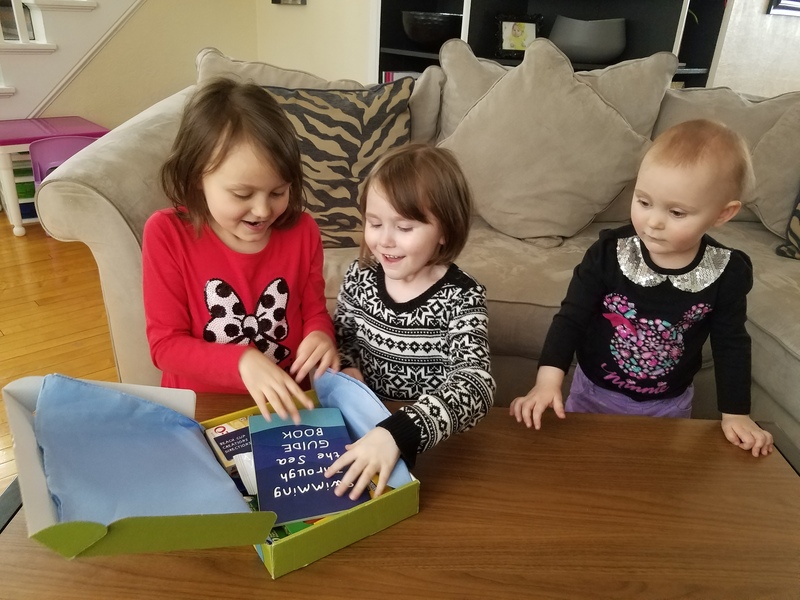 As they were opening up the box, I loved seeing their excitement on their faces. They grabbed everything out of the box to see what they were all going to do. 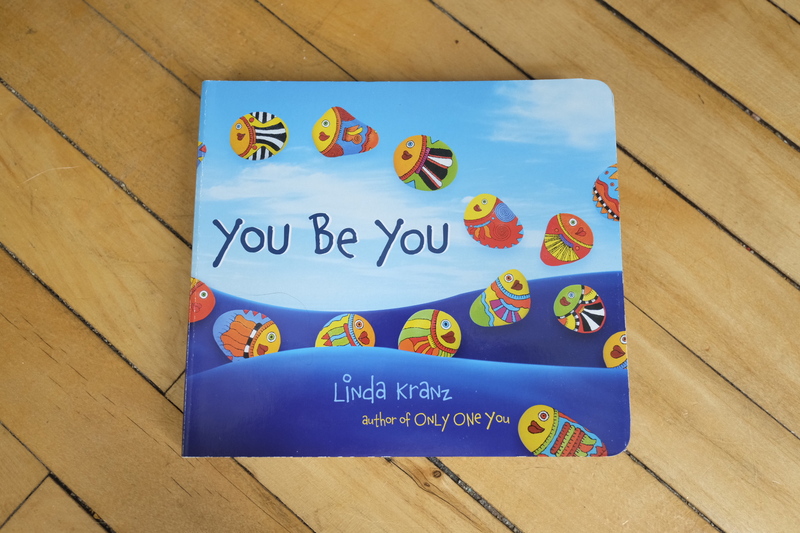 We started out by reading the book that came in the box, You Be You by Linda Kranz. 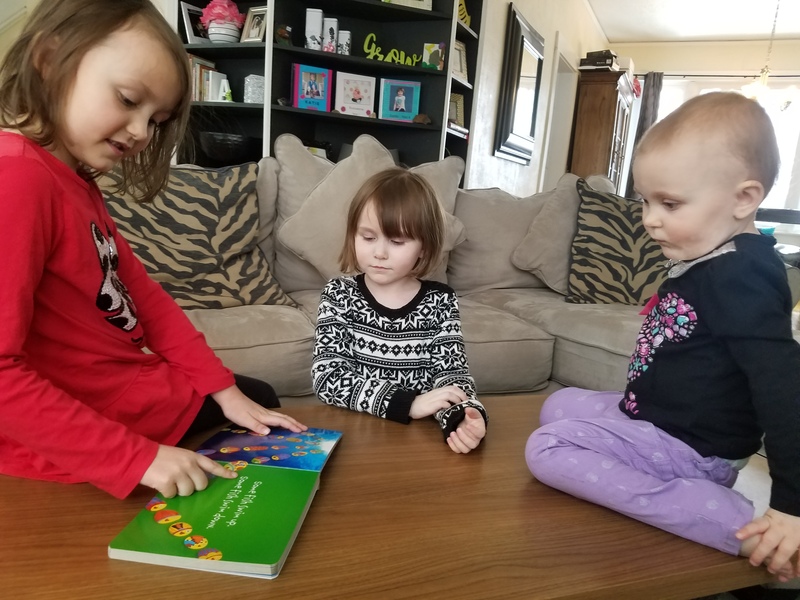 Since Katie has been learning to read in Kindergarten, she helped read the book to us. The book included lots of fun colorful fish. 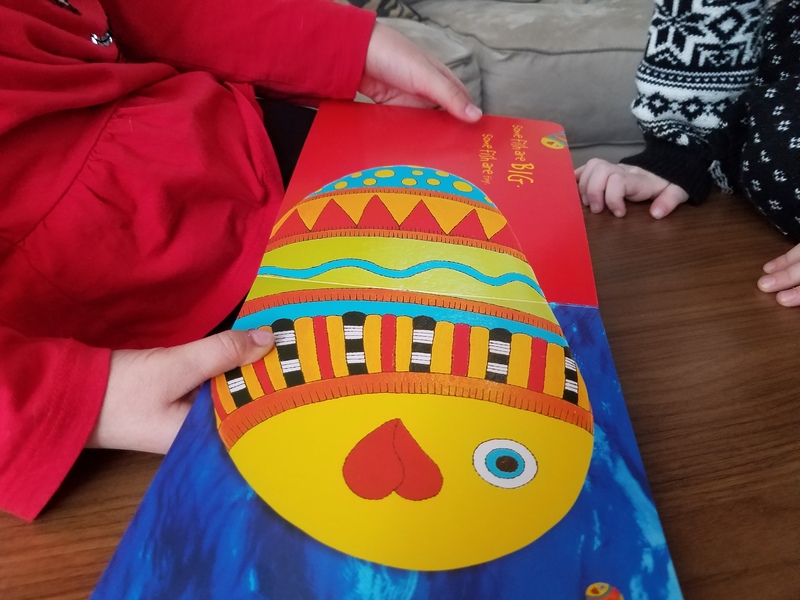 In the book, a little fish swam throughout the ocean and discovered that there are different types of fish. Even though each fish is different, they are all the same and need to be treated with kindness. 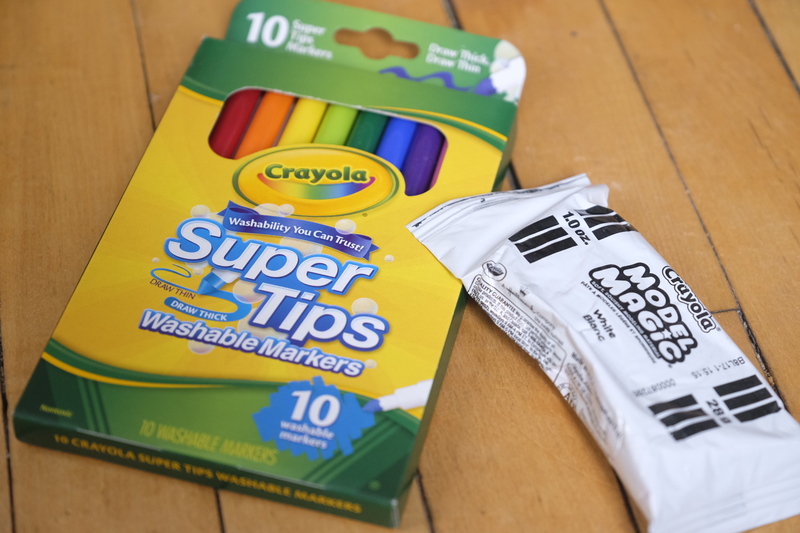 The box included model magic and a set of markers. 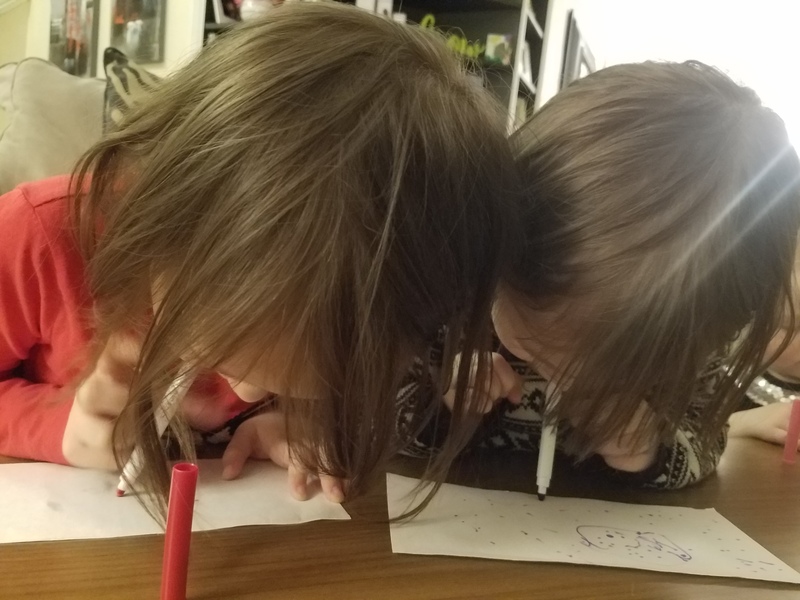 I split the model magic in three and my girls choose two different markers. 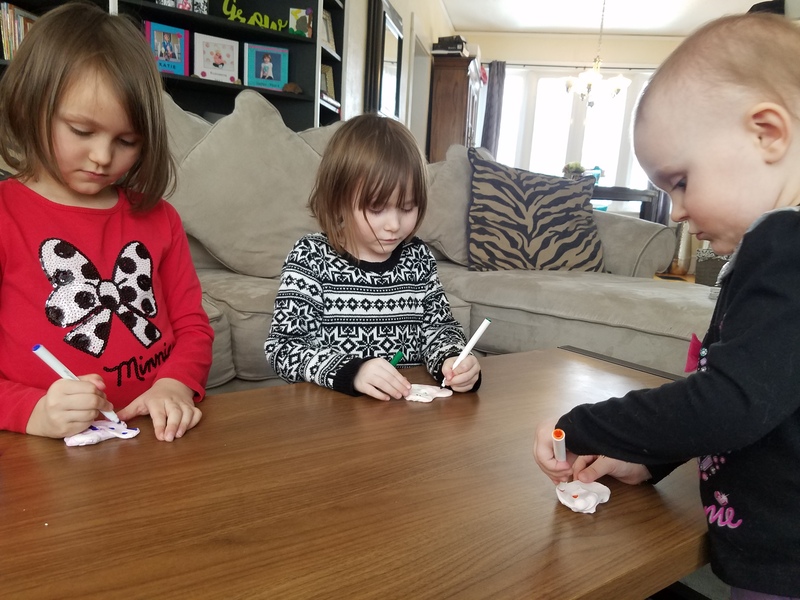 Katie chose purple and blue, Sophia chose red and green, and Elizabeth chose pink and orange. 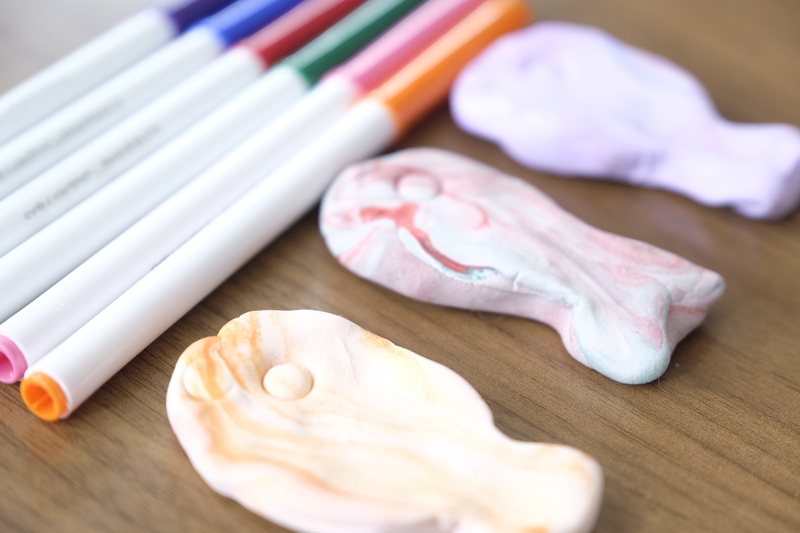 They started out my dotting the clay with the markers and mixing the color into it. 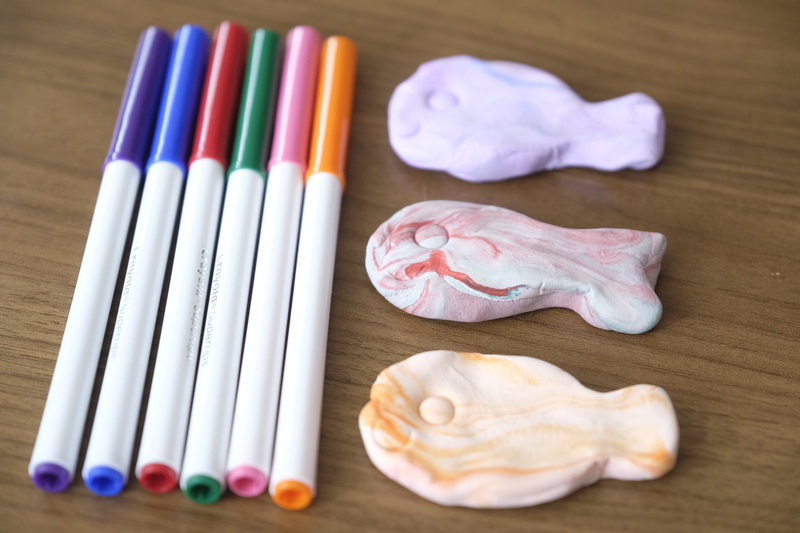 Once they got the color they wanted, we shaped the clay into a fish. 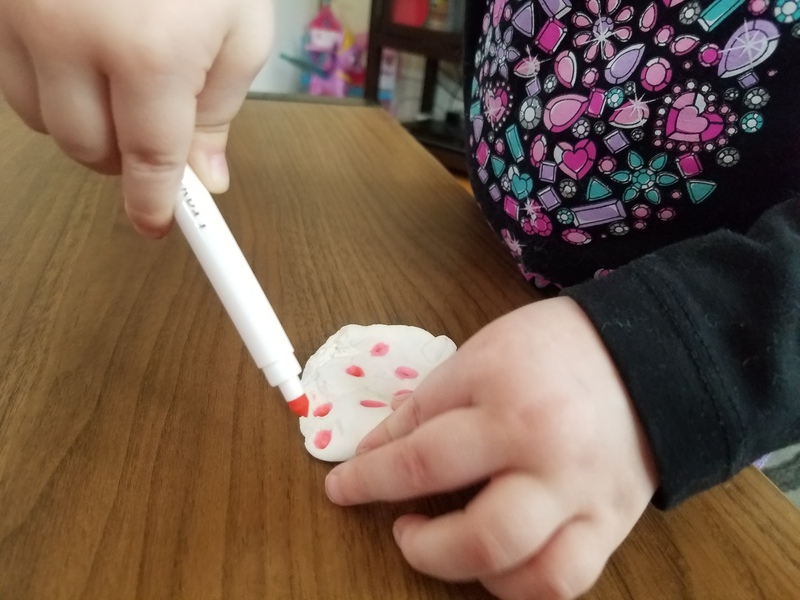 We added an eye and mouth on the fish by using the marker cap. They learned that even though their fish looks different, they were all made from the same model magic. 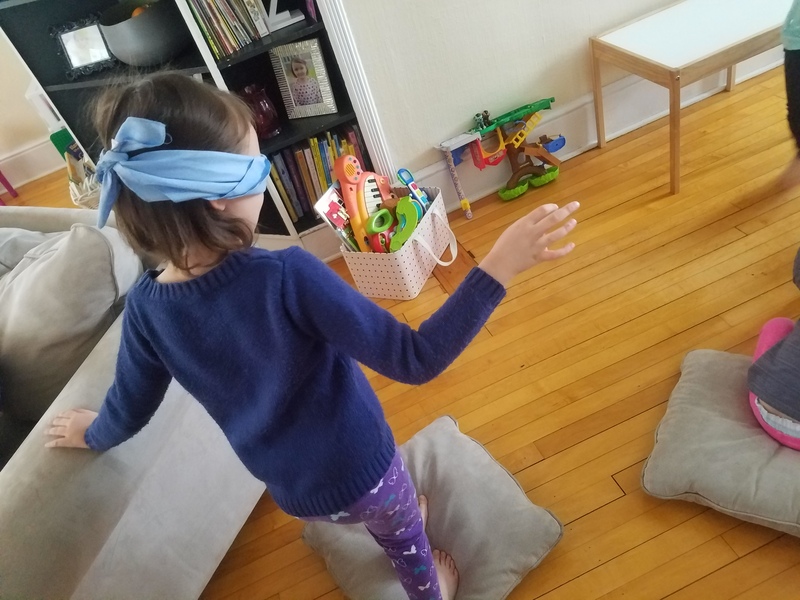 They each put on a blindfold and felt the fish to see if they felt different or not. 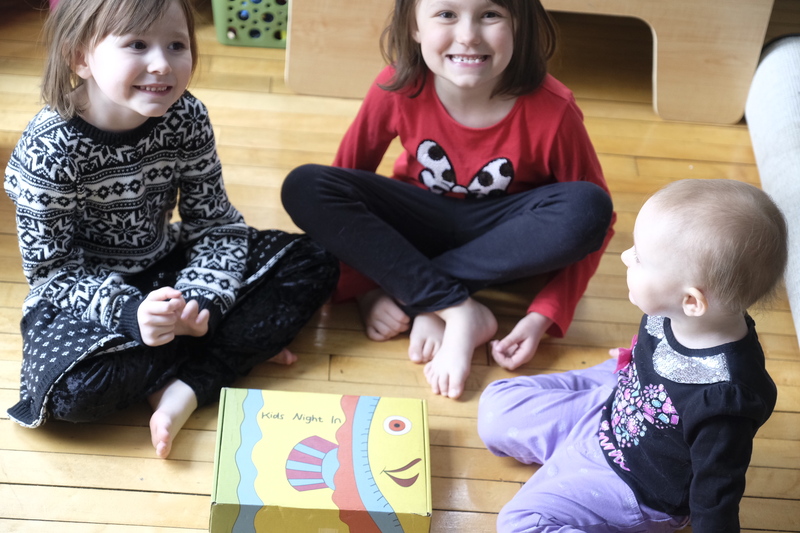 My girls had lots of fun making these fish and added their fish on our built-in bookshelf by their yearly photo book. Next came the braille challenge. 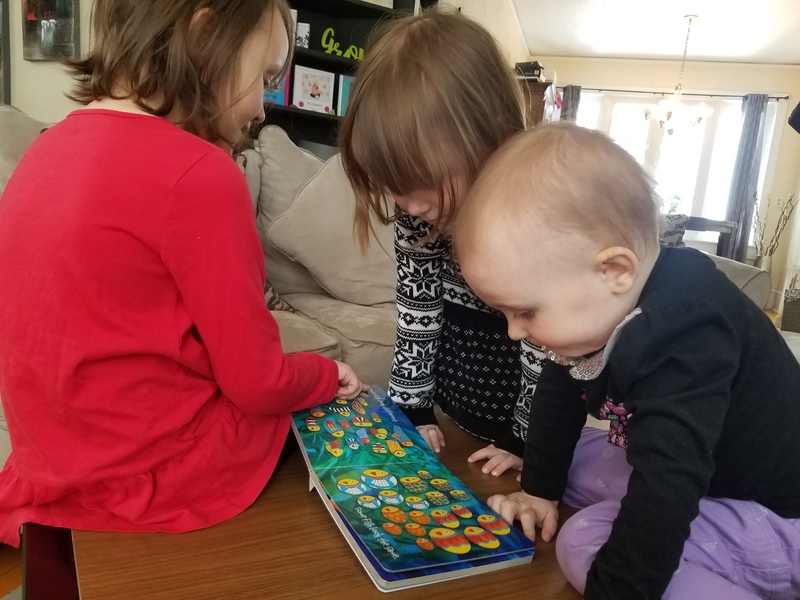 My girls learned that just like some fish swim by the moon, there are some people who are not able to see. They also learned about what it means to be blind and learned about the man who created braille for blind people to read. Louis Braille wanted a better way to print words so blind people could read with their fingers. In the braille challenge, my girls had to decode the secret message on the braille card by using the braille alphabet guide. We even wrote Katie’s name, favorite food, and the word braille in braille. 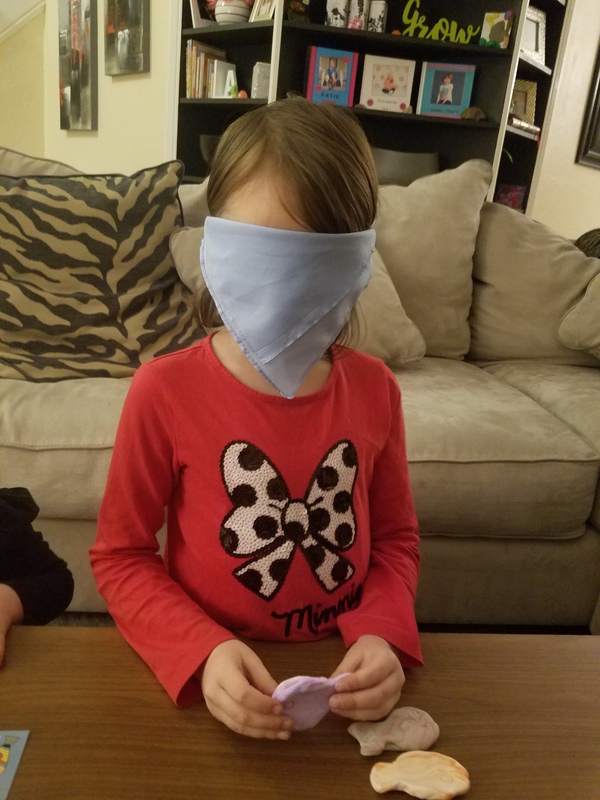 My girls also put on a blindfold to feel the fish and felt the braille card. 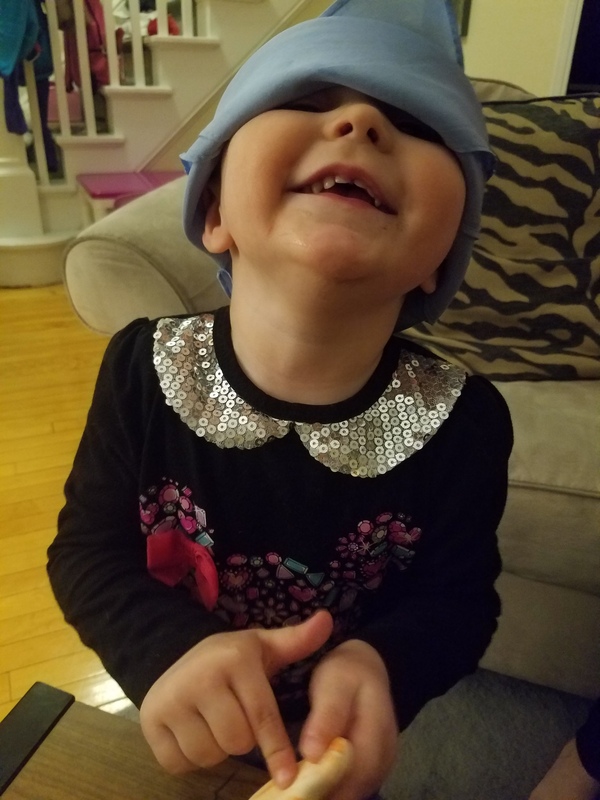 Elizabeth tried to peek through her blindfold. 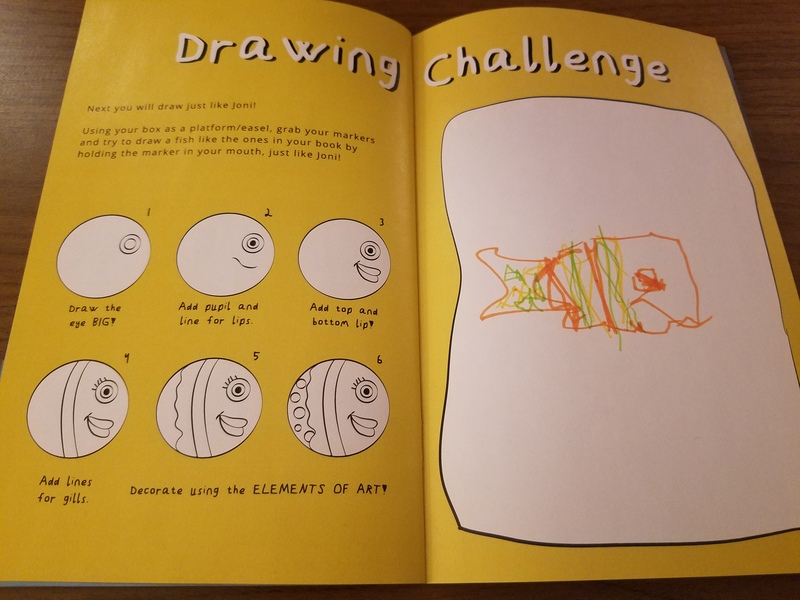 Next was the drawing challenge. 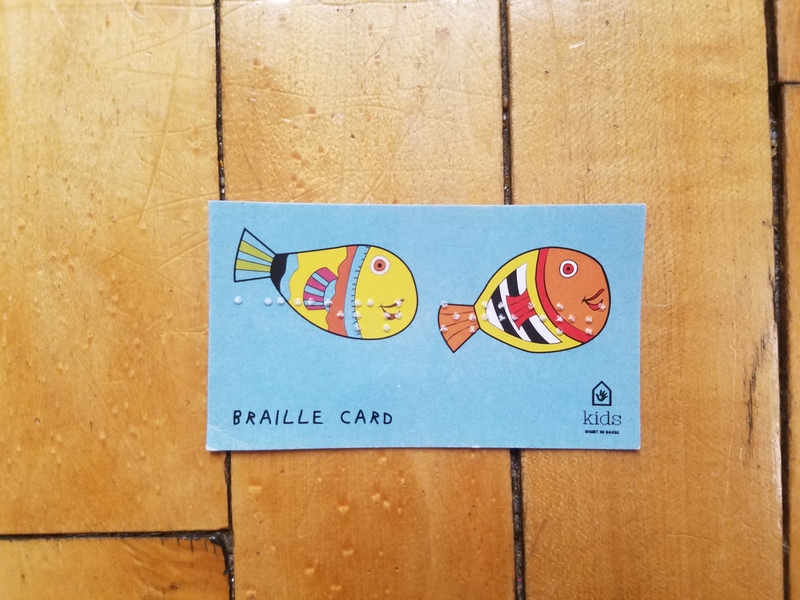 My girls learned just like some fish swim left or right, there are people who are in a wheelchair because sometimes different parts of their body don’t work properly. They learned about a women named Joni Eareckson Tada who became paralyzed from the shoulders down during a diving accident. At first she had a hard time accepting her new life in a wheelchair. But as time went on, she found different ways to enjoy what she loved doing. Joni began holding paint brushes and pencils in her mouth and creating beautiful works of art. 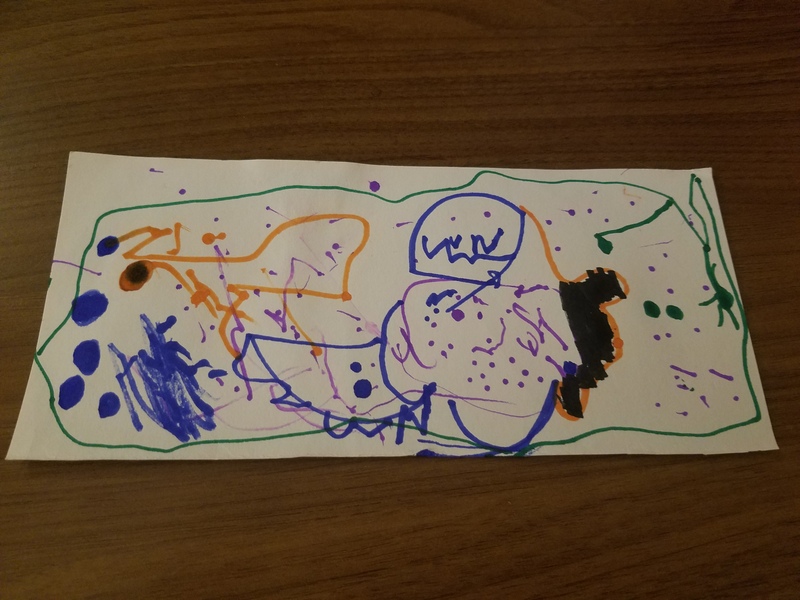 In the drawing challenge, my girls had to try to draw a fish without their hands. It was a little difficult for them to use their mouth to draw. 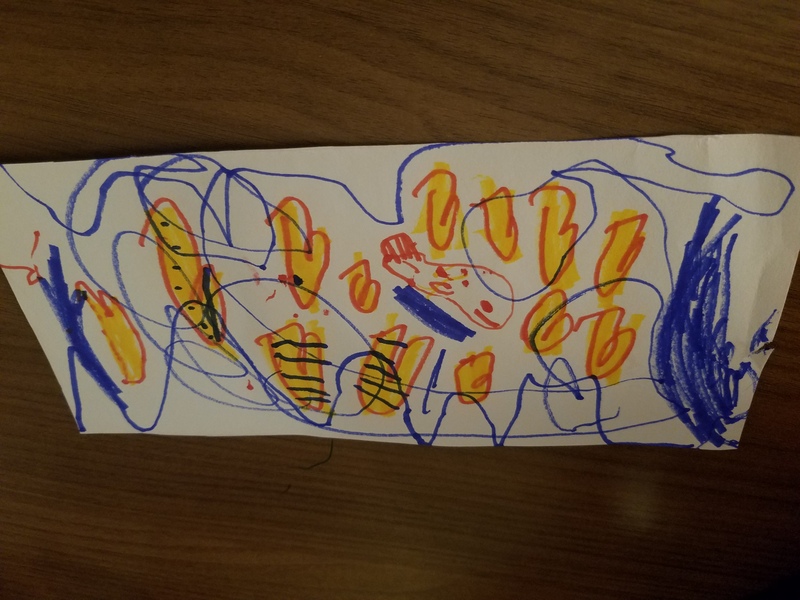 I even drew a fish myself without using my hands. After I did it, Katie and Sophia tried again and they were able to draw a little bit better. 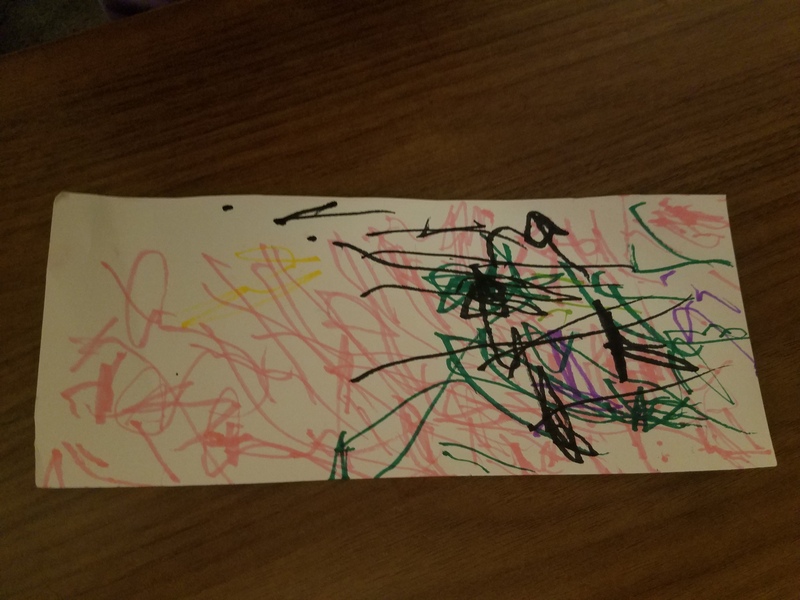 I let Elizabeth draw anything she wanted. We were having so much fun that night, that we didn’t realize what time it was. It was already 9:30 pm and past my girls’ bedtime! So we had to stop our fun for the night and continue the next day. 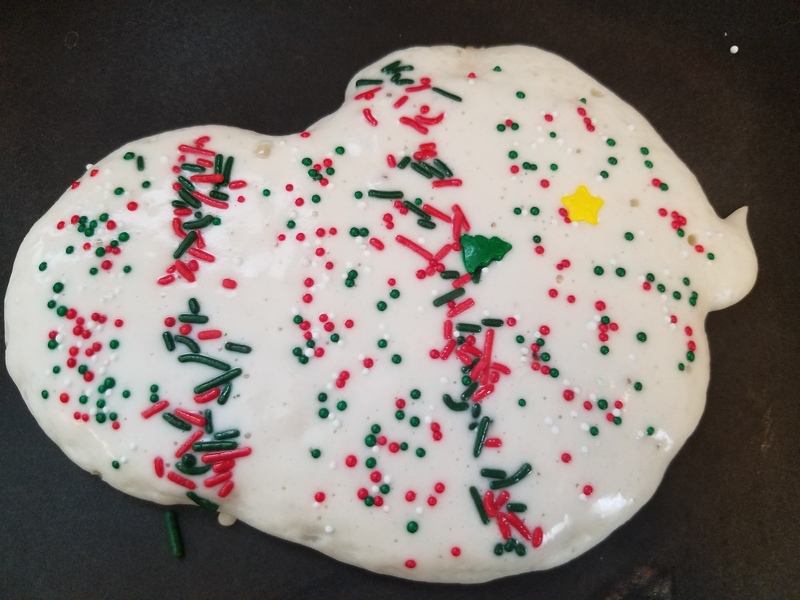 I told my girls the night before that we had to make fish shaped pancakes for breakfast to go along with our fish theme. They were so excited! 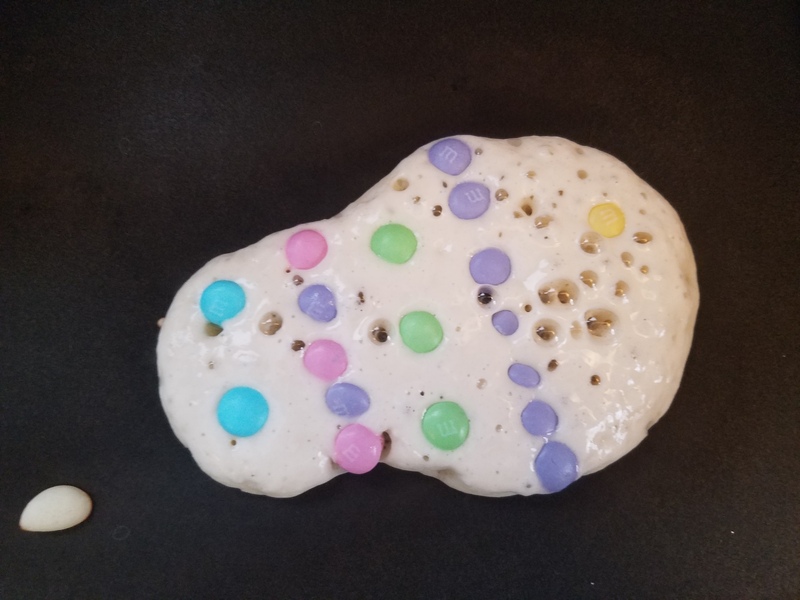 So that morning after I made the pancake batter, I let my girls choose whatever they wanted to design their fish pancake. Katie picked red and green sprinkles. 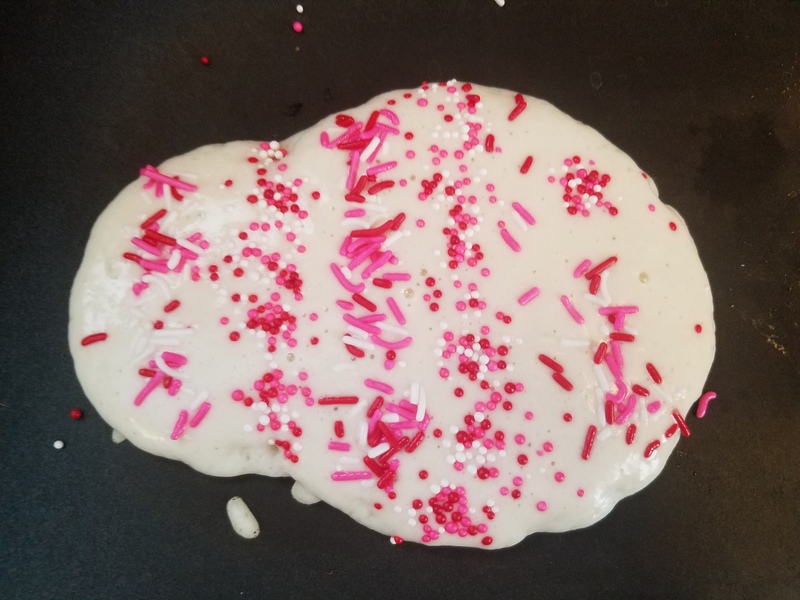 She also had to add more colorful sprinkles on top plus syrup. 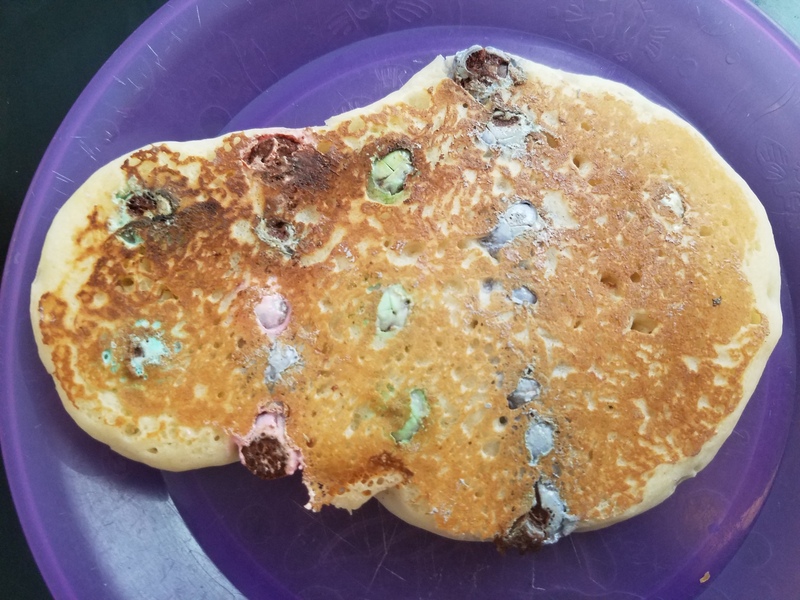 Sophia picked Spring m&ms since they are one of her favorites in pancakes. 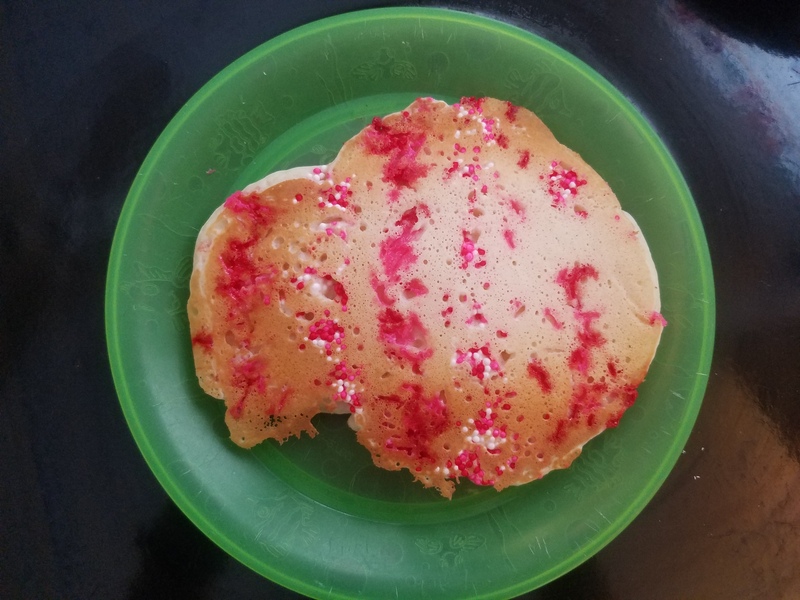 Elizabeth picked pink and white sprinkles. 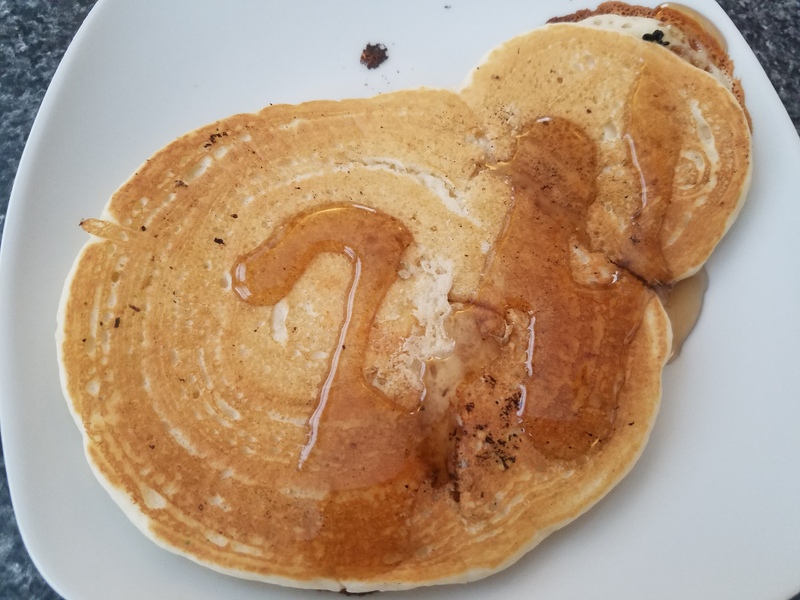 I even made a fish shaped pancake for myself. 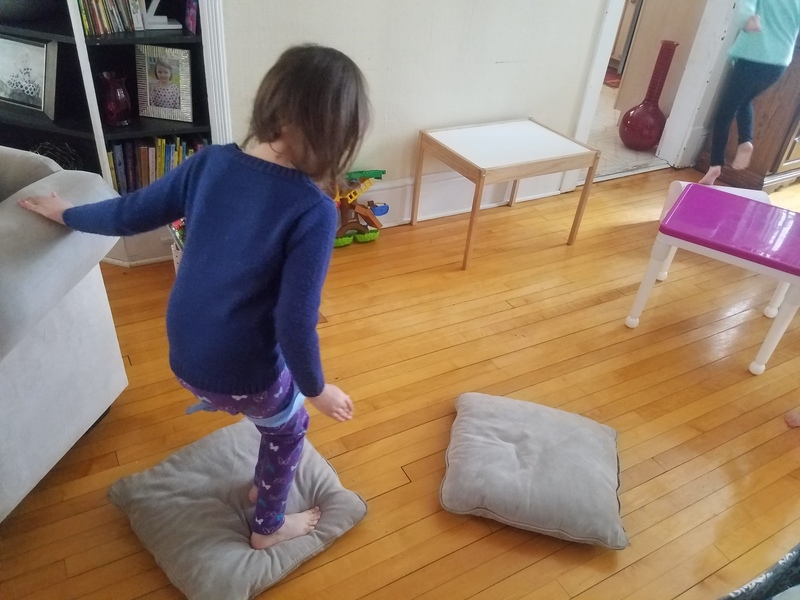 After breakfast was the obstacle course challenge. My girls learned that some fish swim up or down just like there are people who have different physical abilities. My girls learned about a woman named Wilma Rudolph who got a disease called polio when she was a little girl. Because of the polio, it was hard for her to use her left leg. Wilma worked hard through physical therapy and was able to regain the use of her leg. She then went on playing on a basketball team, run on a track team, and went to the Olympics and became the first American women to win three Olympic gold metals in the same year. 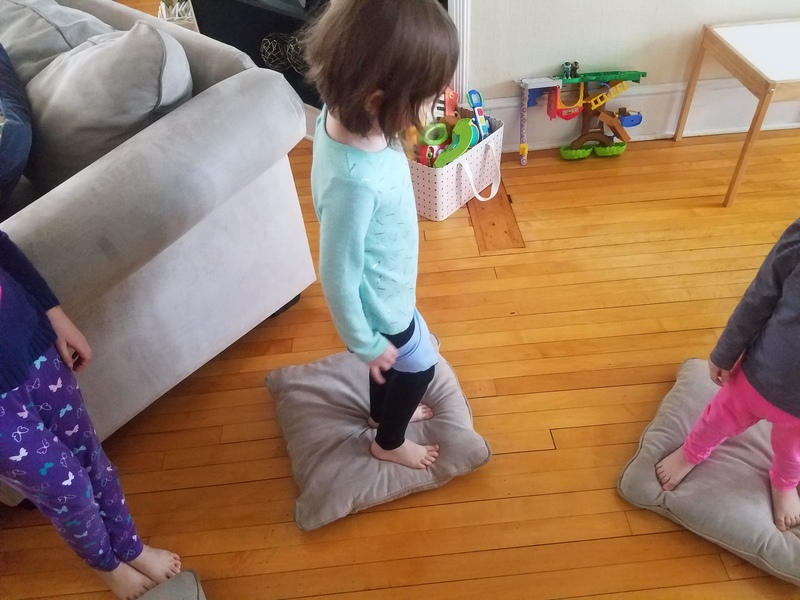 We created a obstacle course and my girls when through it like normal. 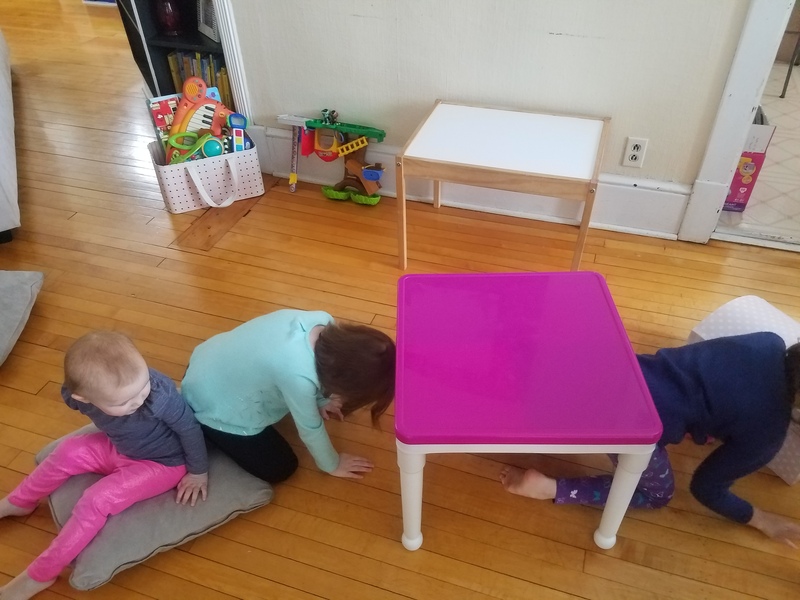 They had to step on the pillows, crawl under the table, and step over the toy chest. 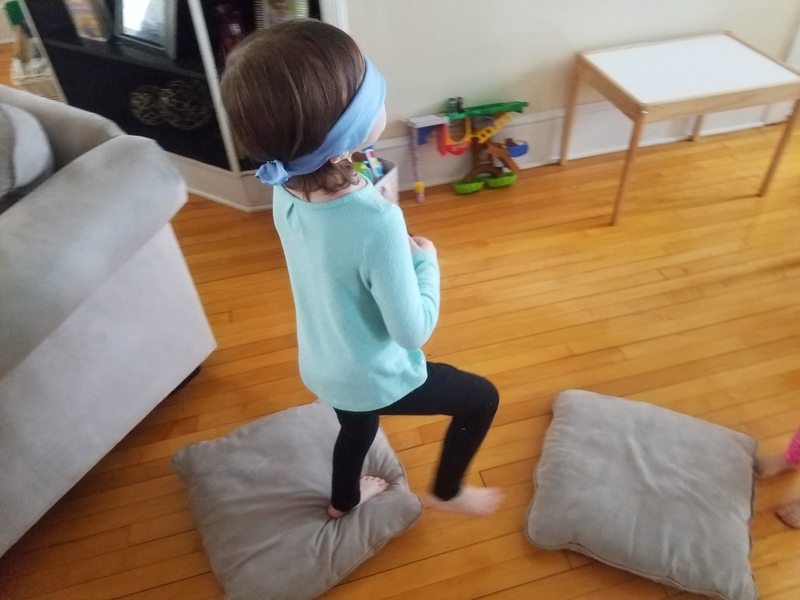 Next they had to try doing the obstacle course with the blindfold tied around their legs, which made it little bit hard for them to go through the course. 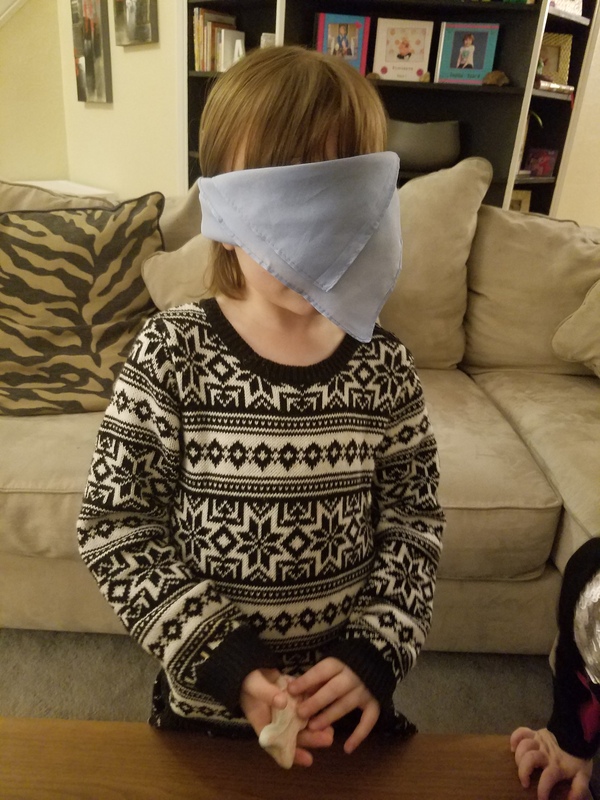 After that, they put on the blindfold and tried to go through the course without being able to see. I helped guide them through the course. They stumbled and took each step slowly. 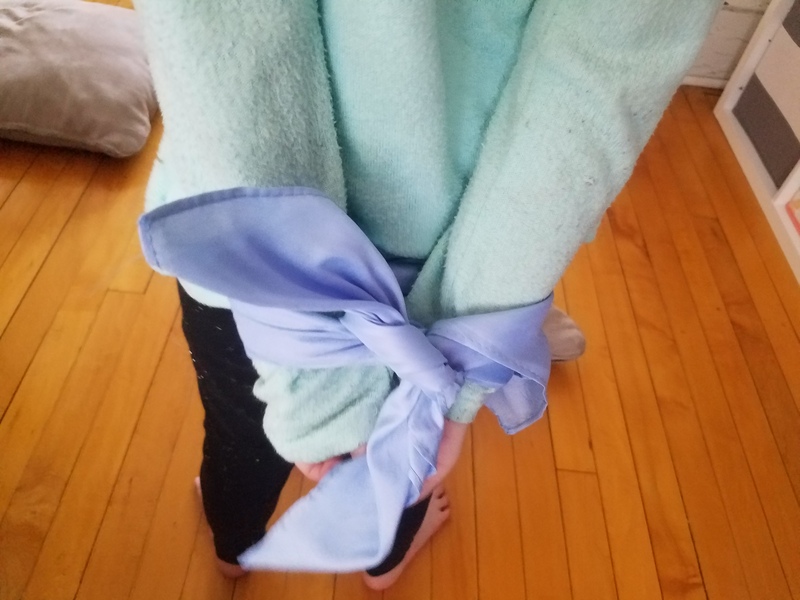 They even wanted to go through the course with their arms tied behind their backs. Next it was lunch time. 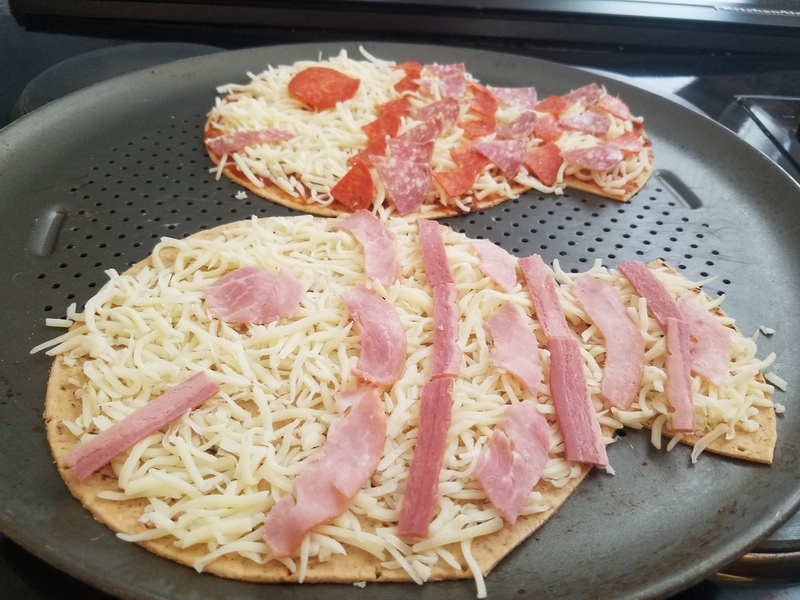 I made two different fish shaped flatbread pizza. 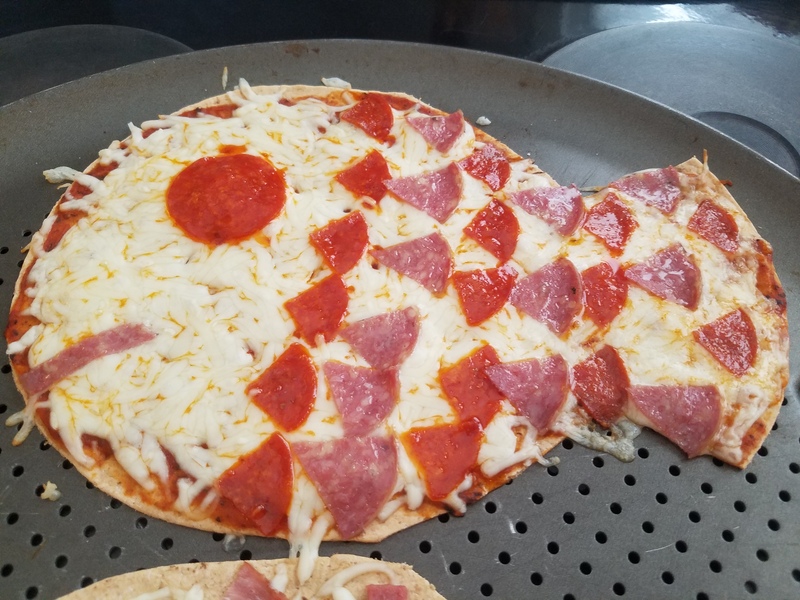 For the first pizza, I made a design on the fish using pepperoni and salami. 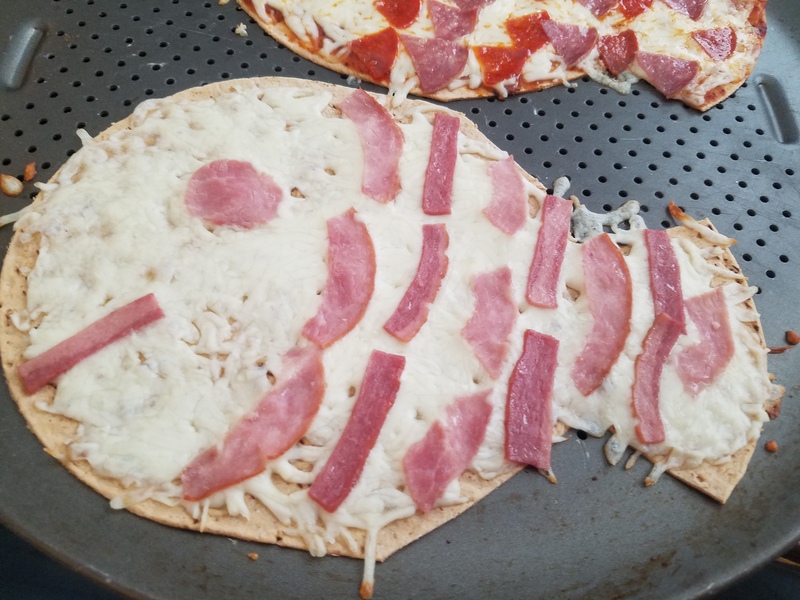 On the second pizza, I designed the fish using ham and bacon. 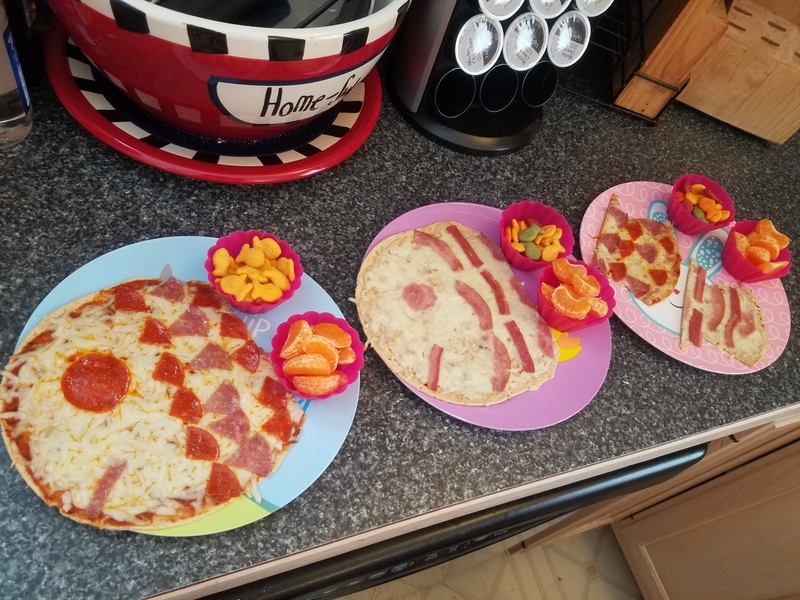 The flatbread pizzas turned out really cute and my girls loved them. I served goldfish and oranges along side the fish pizzas. That afternoon it was snack time! 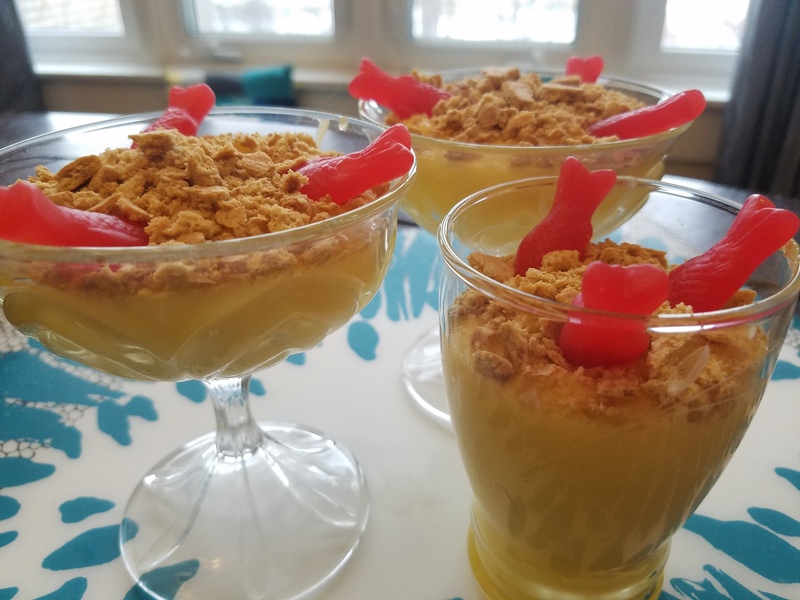 We created Jello pudding beach cups with crumbled graham crackers and fish candies on top. 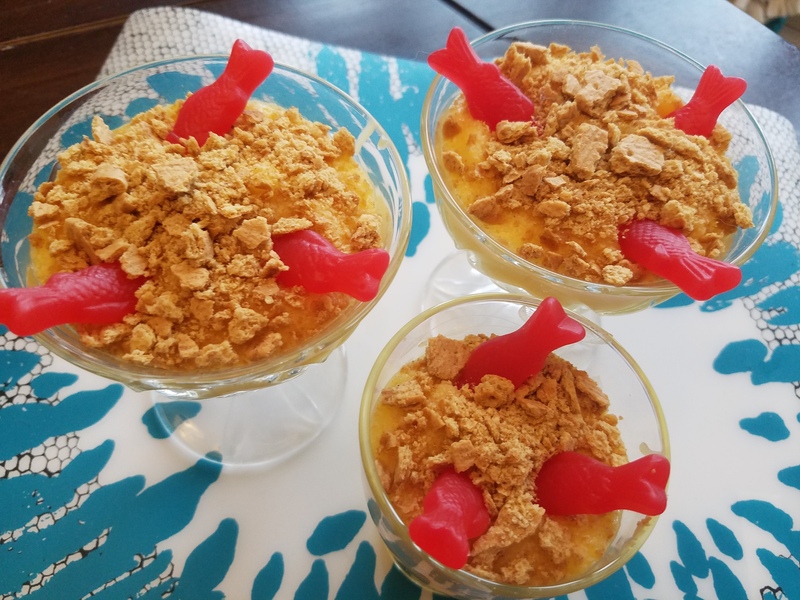 It was a fun snack while incorporating the fish theme. Katie and Elizabeth loved the pudding. Sophia’s favorite part was the fish candy. Overall, the Kids Night In Box was great! 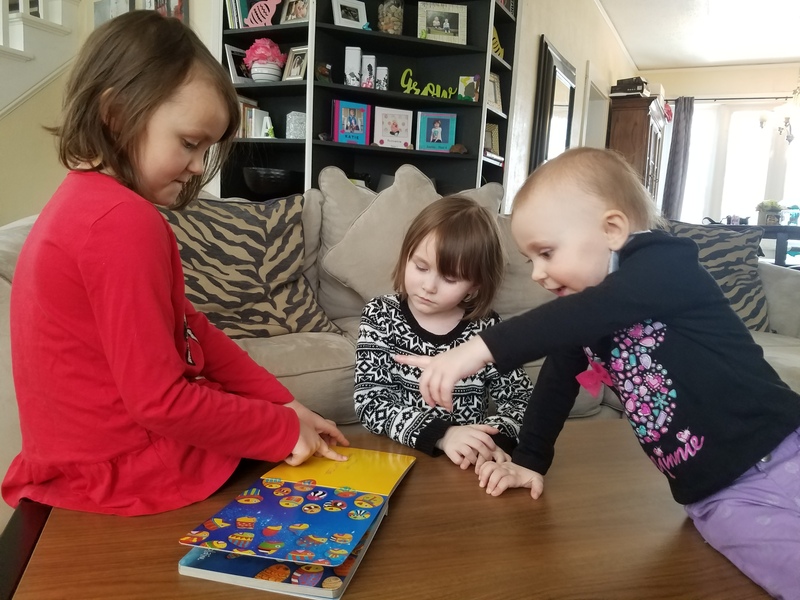 I loved that all three of my girls were able to participate in the activities. 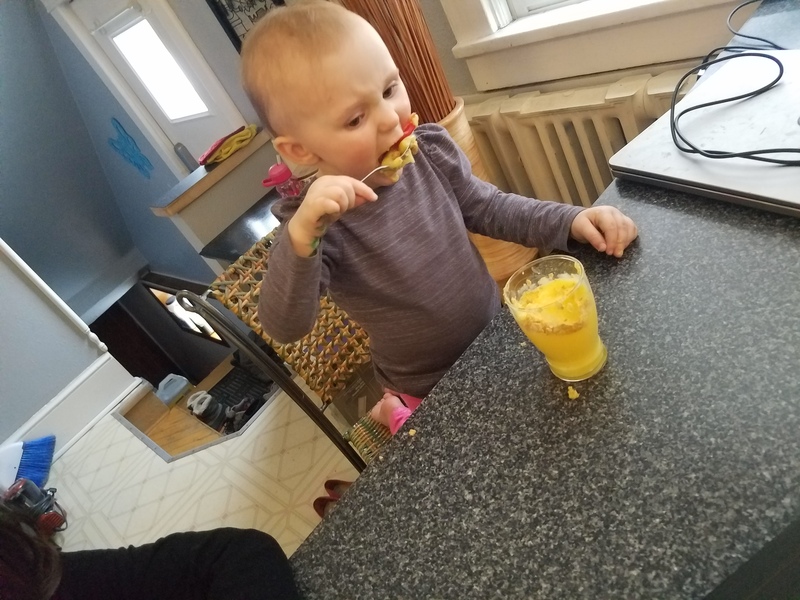 Katie’s exact words were, “This is better than any toy! That was really fun!” Katie even asked me if we could do the box again another time. They are definitely excited for another box next time! 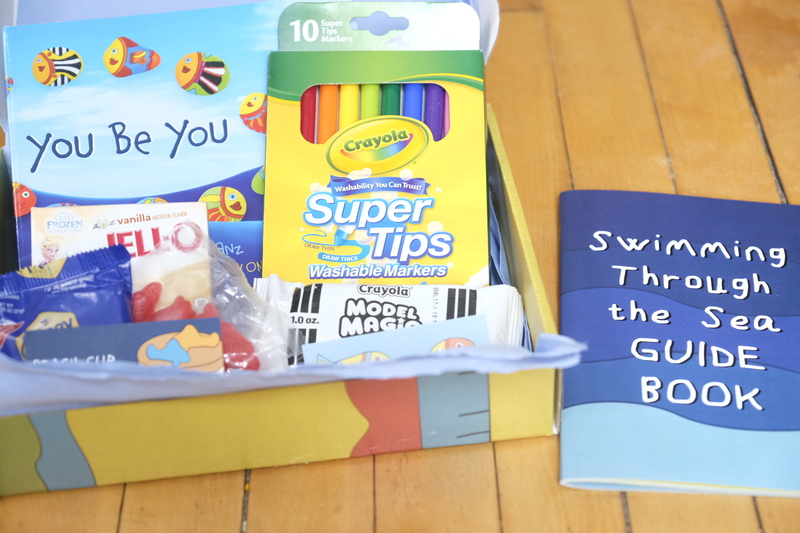 Do you think that your kids would enjoy the Kids Night In Box? Because I know they would! My girls range between almost 2 and 6 years old and they all had a blast. 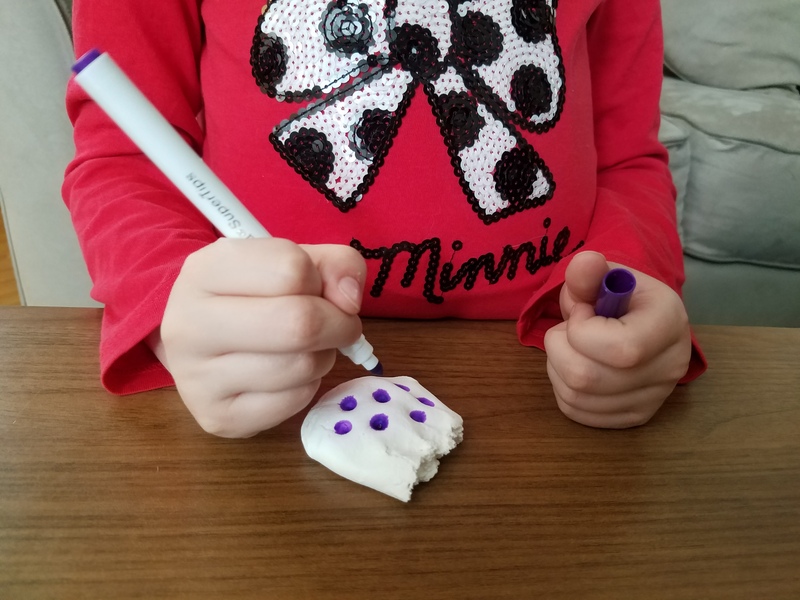 This is such a cute idea for kids and I love how you make he food and snacks to match! Very thoughtful. 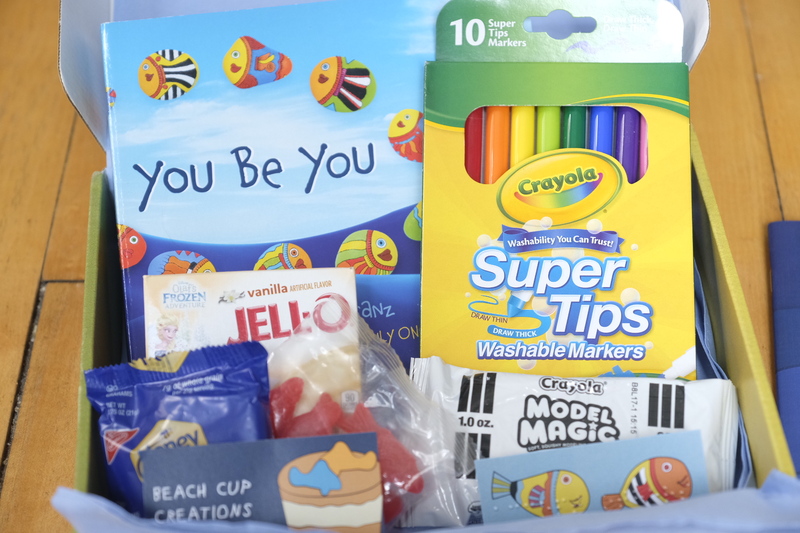 I have never even considered participating in a subscription box for children but what a fun idea! I love all the pictures. You went all out, and it is obvious you all had a night filled with family fun making memories! I love these boxes. We do the date night one because our son is still too young for the Kids Night one. But once he is in the right age group we are totally doing this! I have never heard of this one but it looks like SO much fun! My granddaughters would love this box. This is awesome ! 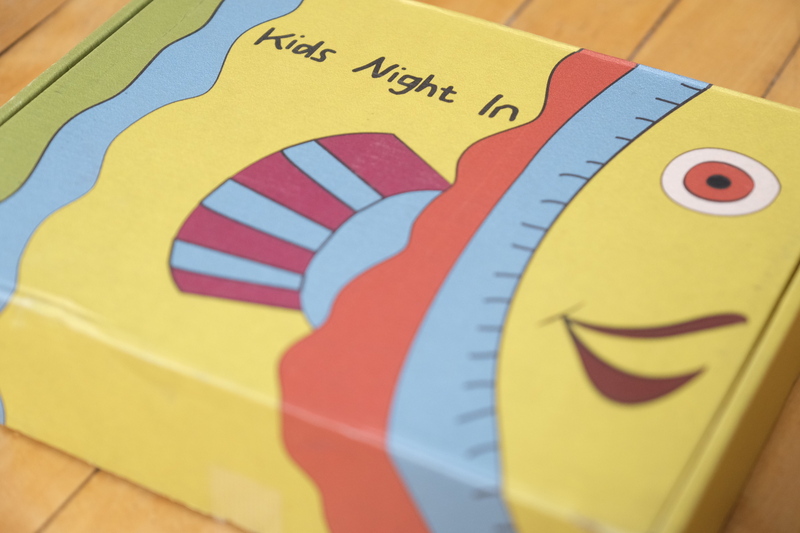 I have never heard of kids night in box but it seems really fun! This is super cute! Looks like you guys had a blast! What a clever and creative box. 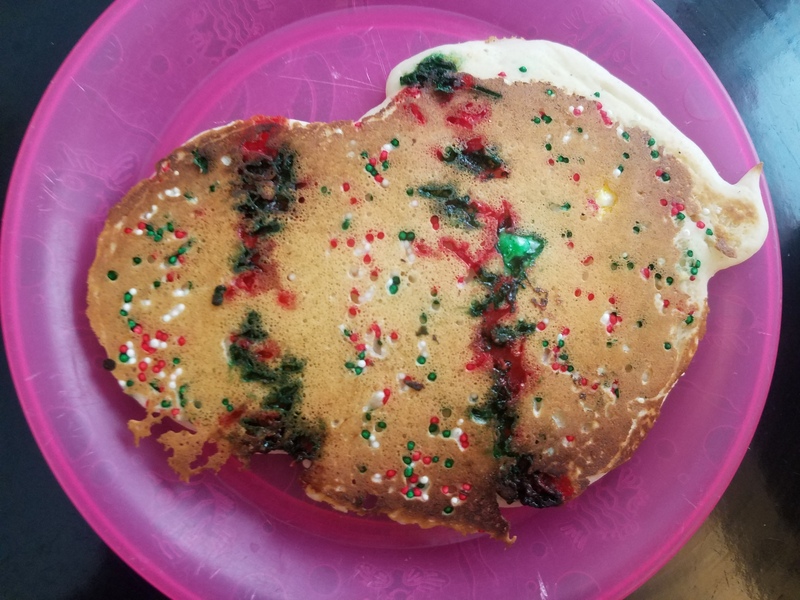 It’s obvious that the company put a lot of time into what they sent out in order to teach the kids and not just feed them. I’m sure your girls will look forward to the next box. How fun! 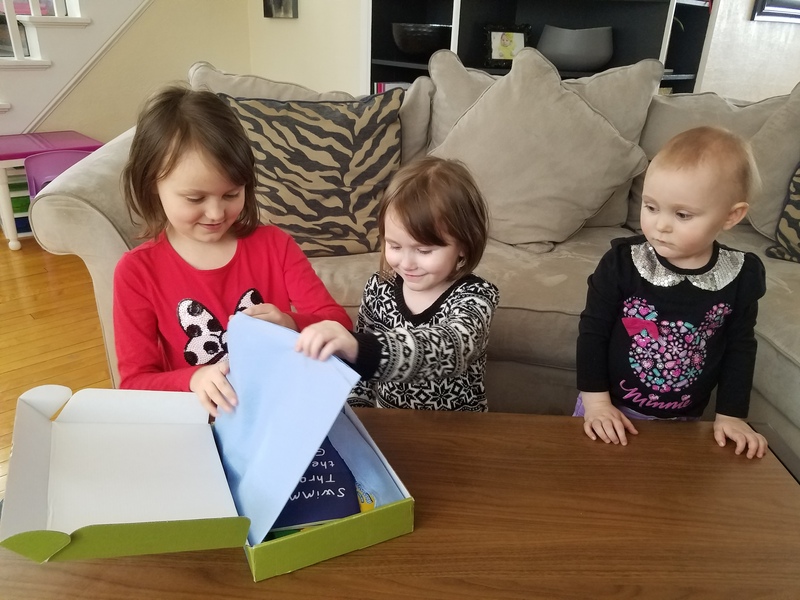 We love a good subscription box and this one looks great! 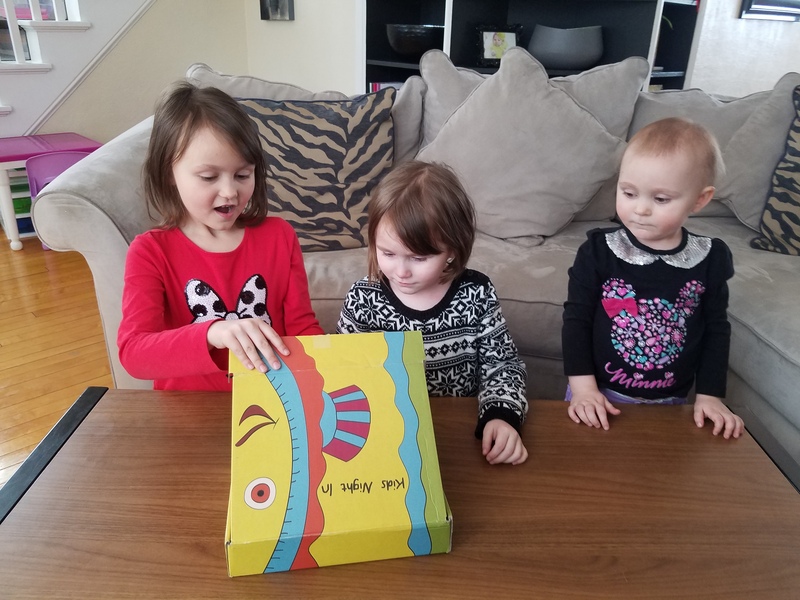 What a fun subscription box for the kiddos! My girls would love it! And love the matching snacks you made! That box looked so fun! 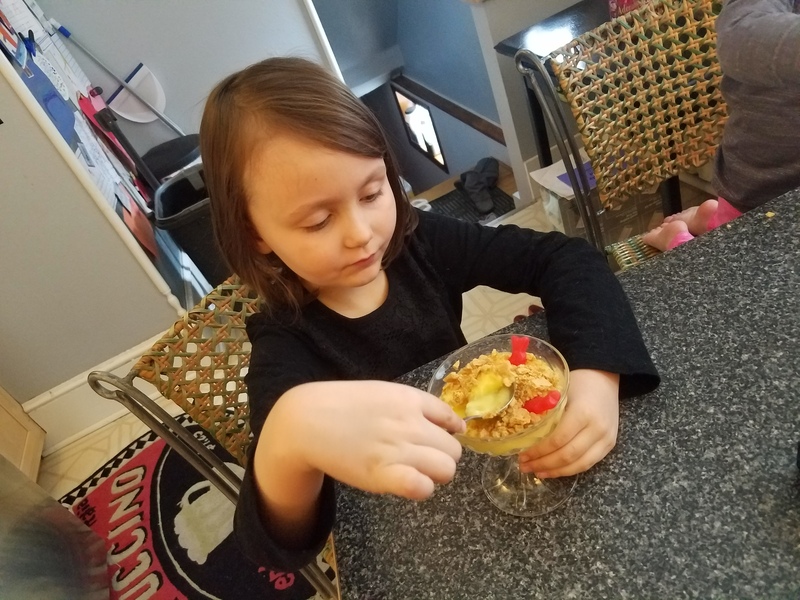 Love how it was jam-packed full of activities and included all of the meal ideas. It makes the whole day fun! Glad your girls enjoyed it! This is such a great idea for a fun night. I would totally try this for a night out for my husband and I and have this kit for the babysitter! Oh how neat…my kids will love this! I love this! 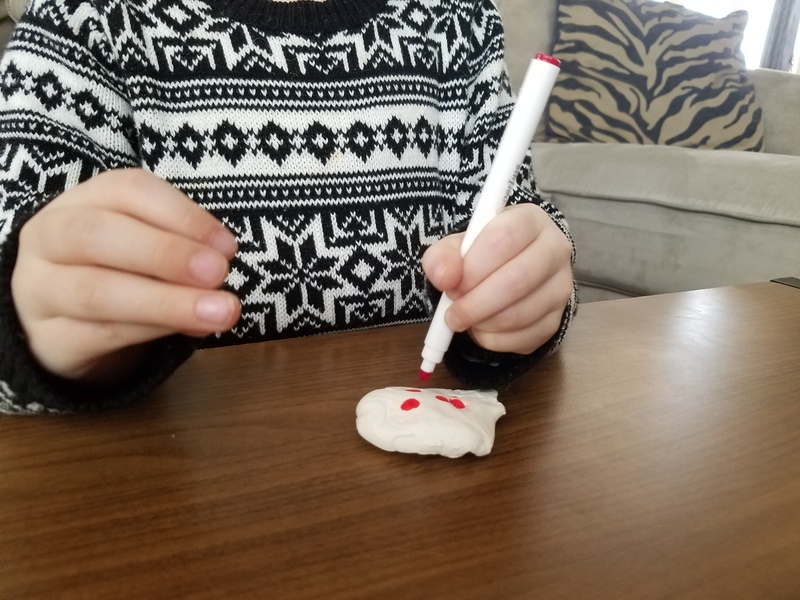 Such a great idea and so many fun activities to do with the kids all in one box. I think this is the best subscription box I have seen so far! This is such a fun box!!! 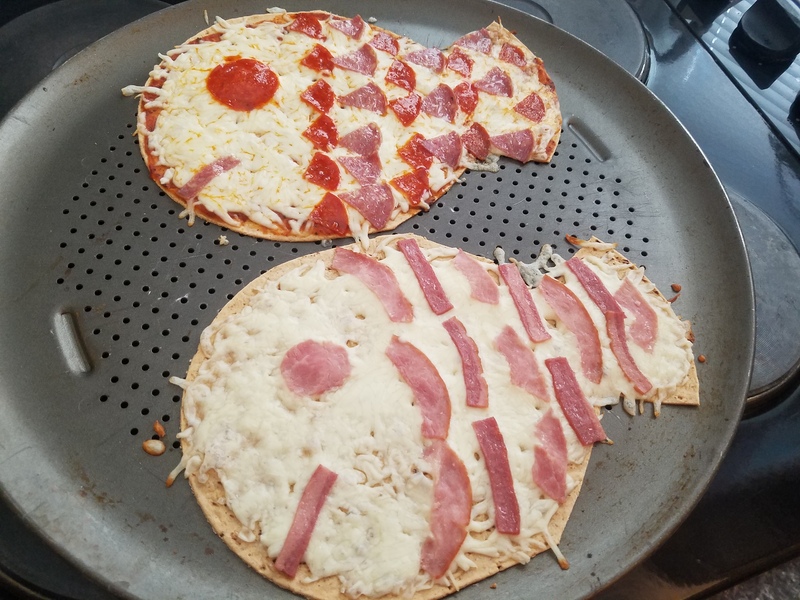 Love all the activities, and the fish shaped pizzas were great! How fun is this? I hadn’t heard of this subscription box. It does seem like a lot of fun, and I think my oldest niece and nephew would enjoy it.